The power of the library to change a life is so well documented that it can almost be taken for granted, but those whose lives have been changed never forget the lifeline that was offered. The recovering alcoholic, the budding writer, the fearful agoraphobic, the unemployed miner, the entrepreneur with an idea, the isolated single mother, the recently diagnosed cancer patient, and the musician in search of an orchestra. In my days working on the front line in libraries, before joining the Arts Council, I met all these people. I saw them each at a cross-roads, each uncertain what to do next. Sometimes, after offering prompts, resources and directions, I never saw them again. Occasionally, it seemed as though I walked with them every step of the way. At other times, they returned months, even years later to seek me out and tell me what they had done, bristling with pride and gratitude. To take just three examples... The unemployed miner had qualified as a social worker since I’d last seen him. The entrepreneur had started her own company and had picked up her first export order. And the isolated single mother had moved through voluntary work to secure her first job. I was not exceptional at my job. It’s what librarians do day in, day out. They work with their books, knowledge and information in safe trusted spaces. Libraries are community hubs that unlocks potential and offers a gateway to opportunity for those in need of a second chance or a fresh start. The new DCMS-funded Libraries: Opportunities for Everyone innovation fund was announced yesterday in the Libraries Taskforce’s Libraries Deliver: Ambition for Public Libraries in England 2016-2021 document. Administered by Arts Council, the new Fund plays to this strength of libraries. There is £4 million available to reach more people, and encourage libraries to test new ways to reach them. This Fund will helpfully build on the free access to WiFi which is now in place in over 99% of public libraries in England following last year’s successful programme. With this new fund, I would love to see libraries reinvigorated by offering ways to overcome the challenges of modern life. Some people face real barriers of disadvantage, while others are simply struggling to do more than cope. And libraries are in the unique position to offer them more than a good web browser and a cheap way to access books. This fund means that library services, along with their partners, will be able to apply for between £50k and £250k to deliver projects that provide local people with opportunities. We want them to be innovative, to try approaches they haven’t tried before, reaching people experiencing disadvantage with whom they haven’t engaged before. We’d like to see them involving their target audience in developing the idea, and we’ll want to hear how well it’s gone so that everyone can learn from the experience. The scheme is launched this week and applications can be submitted between 5 December and 6 January 2017. The activity has to take place between April 2017 and March 2018. I believe that the return on this investment in our libraries will be felt in years to come, as those who benefit find a new direction in their life. In overcoming disadvantage for themselves, they could also remove that barrier for others that follow. These are not just fine words. For those who face an uncertain world, such as the hitherto confident professional woman suddenly made redundant, the recently divorced small businessman, and the person with disabilities turned down for job after job, this is very real. I’ve met them. 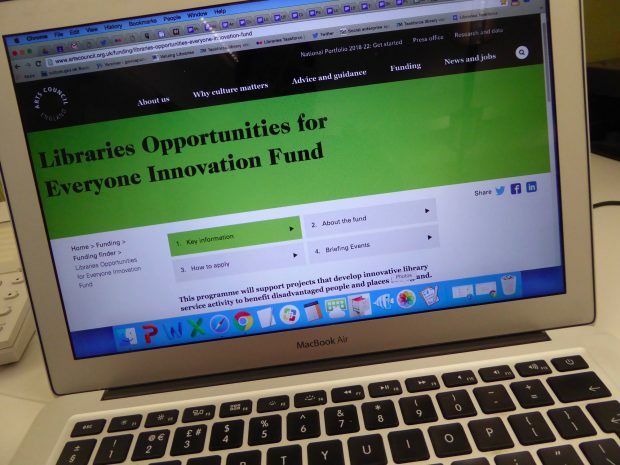 Learn more about the new Libraries Opportunities for Everyone Innovation Fund, and find out how to apply. UPDATE: Details of 3 briefing events now added to the Arts Council guidance. Follow the Arts Council on Twitter.